JDC - Archives : A man carrying a violin case with luggage tag for "Greek Line". Title A man carrying a violin case with luggage tag for "Greek Line". 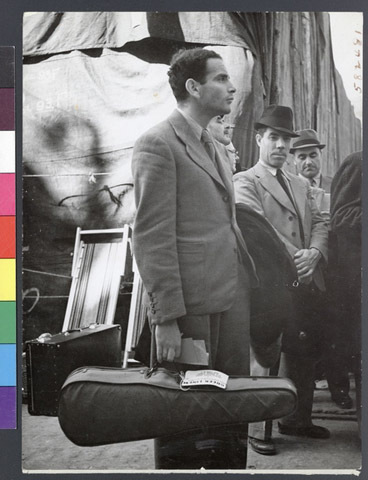 Description A refugee carrying a violin case as he waits on the dock to emigrate on the S.S. Nea Hellas, but sailing was cancelled due to hostilities between Greece and Italy, stranding 12000 refugees in Lisbon. JDC worked to help refugees emigrate overseas.